As you may have gathered from the four pages worth of bean-centric dishes I’ve blogged about here, we like our beans, so I was very happy to learn that dry heirloom beans from Freedom Bean Farm in Maine would be returning to our Wintertime Farmers’ Market. I’ve made some version of this white bean and roasted garlic soup for ages – probably since my teenage vegetarian years. I’ve done it with canned beans, with fresh beans in season, and with cooked dried beans, and I have to say the the last version is probably my favorite, as the bean cooking liquid adds so much flavor to the soup. In previous versions, I’d roast a head of garlic at the same time the soup cooked, but now that I’m making batches of garlic confit on a fairly regular basis, I’ve taken to adding some of that instead. 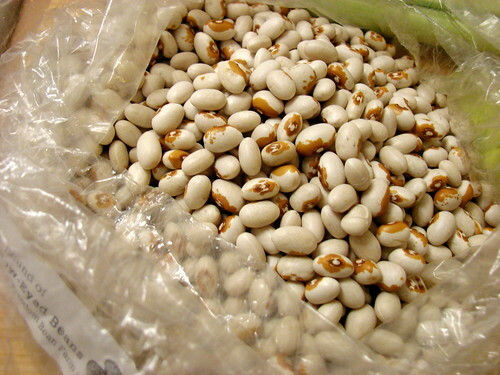 You don’t have to use white beans, of course – but I like them here for aesthetic reasons. Separate the cloves from the heads of garlic, peel them, and lay them in a single layer in an oven-proof baking dish. Add just enough olive oil to cover, then cook in a preheated 300 degree oven for an hour or so. Allow to cool, transfer the garlic and oil into a covered container or a glass jar, and store in the refrigerator for up to one week. In a large, heavy bottomed pot, heat the garlic-infused oil over medium heat. Add the leeks, carrot, and celery, season with salt, and cook until soft. Add the oregano and bay, let cook briefly until fragrant, then add the wine, allowing it to bubble up for a minute or two. Add the parmesan rind, water, and potato, and let cook until the potato is tender when pierced with a fork. 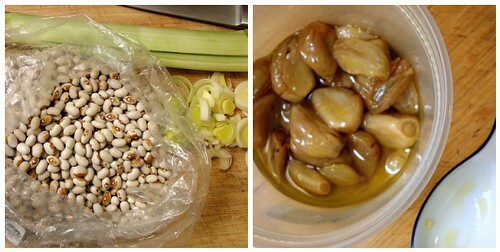 Mash the confit garlic cloves until they form a paste. Add the beans with their cooking liquid, the garlic confit, and the dry pasta, bring to a boil, then simmer until the pasta is al dente. Add the spinach right at the end, stirring it through until it is bright green and wilted. 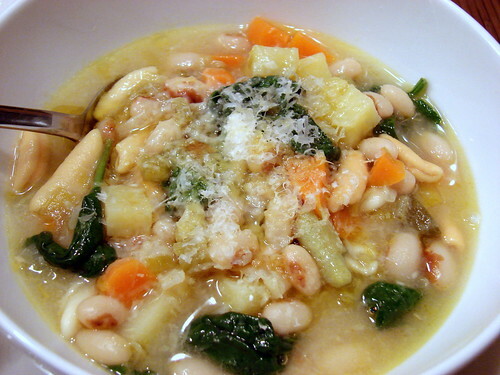 Remove the bay leaves and the parmesan rind and spoon the soup into bowls, topping with grated parmesan if desired. Jennifer, I also love beans, especially white beans in soup with garlic. This looks delicious! Garlic confit…nectar of the gods!!! I am a fan of those beans too! I had a bag of Marifax from a while back and just recently made them into baked beans – way better than the can. Your recipe looks soup-er good. Do you think this would work using the 90 minute-low oven bean cooking method (which I learned about from you!)? That has helped me get over my fear of dried beans. Hooray! I bought those beans — they were just so gorgeous I couldn’t resist, but I didn’t know what to do with them. This sounds perfect for a dinner next week. Thank you! shayma – Thanks! I always save the rinds to toss into soups or make into parm broth – it adds such a nice flavor! Stephanie – Mmmm, I had some of those last year, too, and they were also fabulous. Emily – I bet they’d work well cooked that way! Ann – Thank you! I hope you enjoy it! I have been craving garlic confit since you last posted about it! Thanks for the great idea for roasting garlic–easy and then you get the great, flavorful oil. I made a white bean dip this morning for our party tonight, and used confit garlic plus the cooking oil in the dip. It took it over the top. Lovely!